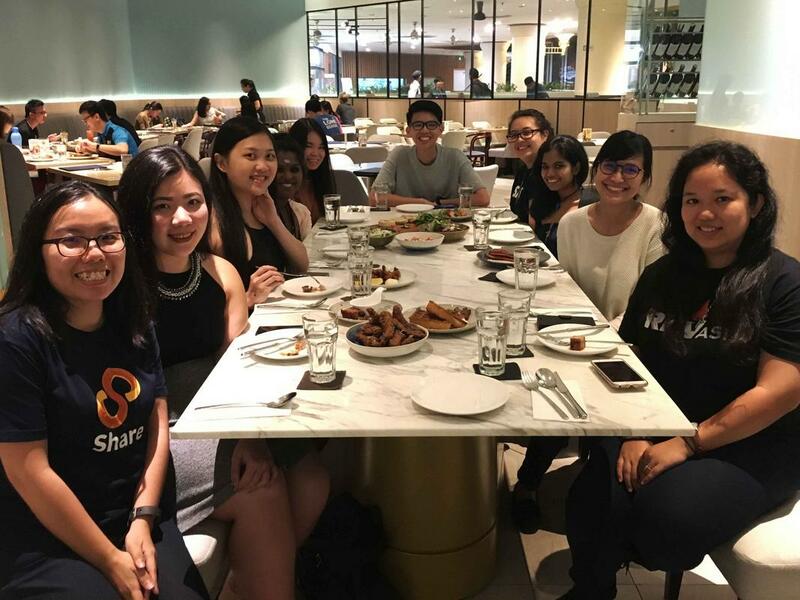 It's time for our annual pig-out with ANTE! Following the food coma-inducing feast we had last year, we jumped at the chance when the premier pork restaurant invited us over again to experience their annually-refreshed menu. 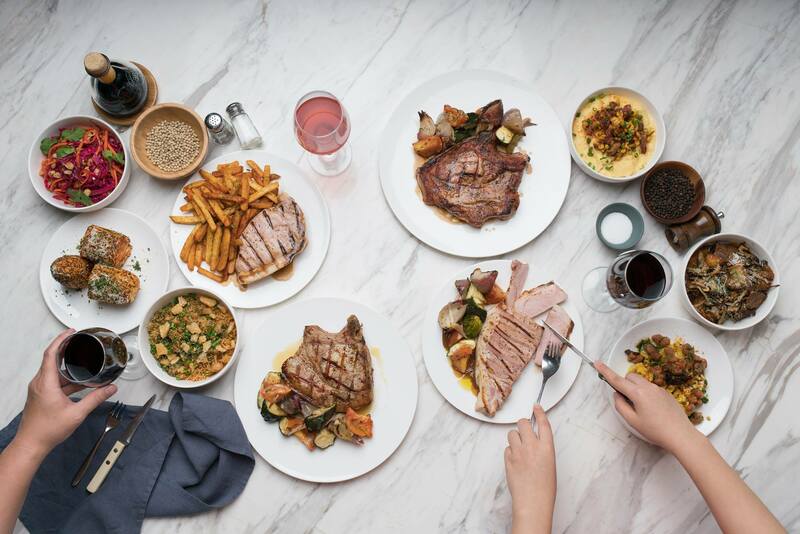 This time around, ANTE - celebrating its fifth anniversary this year - revised its menu to revolve around the idea of sharing food, as evident by the addition of hearty and individually portioned sides to accompany the mains (pictured above). Melty cheese wheels have been a trend in casual dining since raclettes went viral last year. 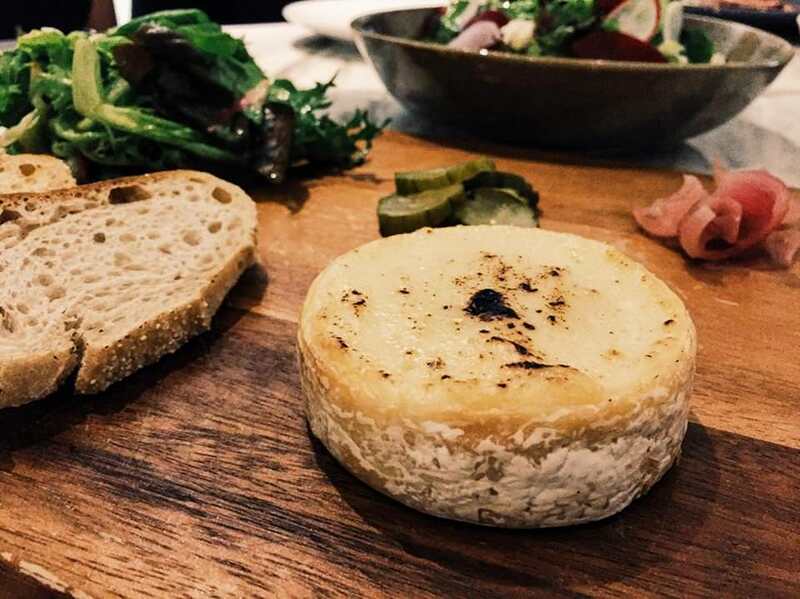 ANTE's Baked Cheese Wheel (RM28) features a wheel of Brie cheese (airflown from France!) served on a wooden board alongside mesclun salad dressed with raspberry, homemade pickled cucumbers and red shallots, with four slices of country loaf to dip in the melty cheese. The Green Curry Seared Duck (RM25) is our second favourite starter of the night. 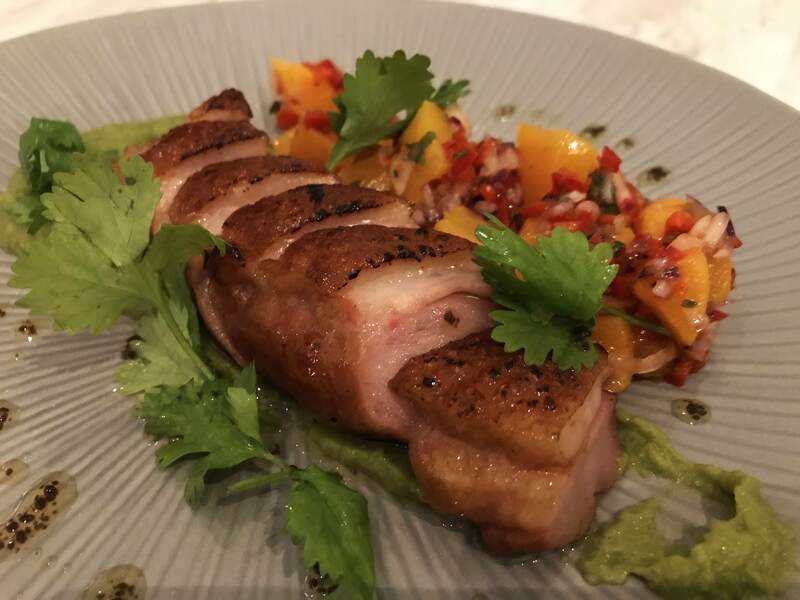 The duck pieces are as juicy and tender as ever, the green pea curry cream turned out to be a surprising burst of flavour despite our initial skepticism, and the peach salsa is a refreshing enough to balance out the strongly-spiced sauce. Crispy Miso Skin Pork Belly. 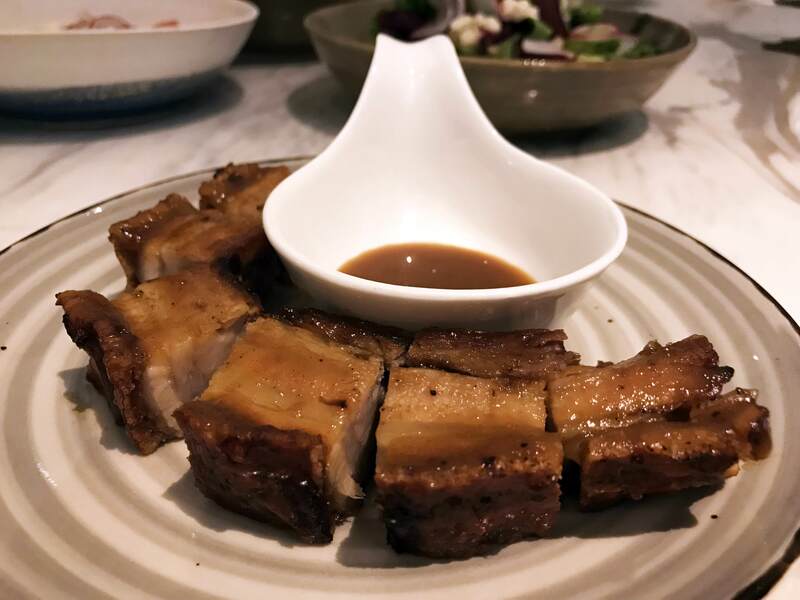 Though we still preferred the melt-in-your-mouth pork belly dish from last year, the Crispy Miso Skin Pork Belly (RM21) would probably appeal to diners who prefer crackly skin on their *siew yoke*. ANTE's pork belly is marinated in yuzu kosho (a Japanese condiment made fresh chillies fermented with salt and zest and juice from yuzu) and a little bit of sake to enhance its flavours. 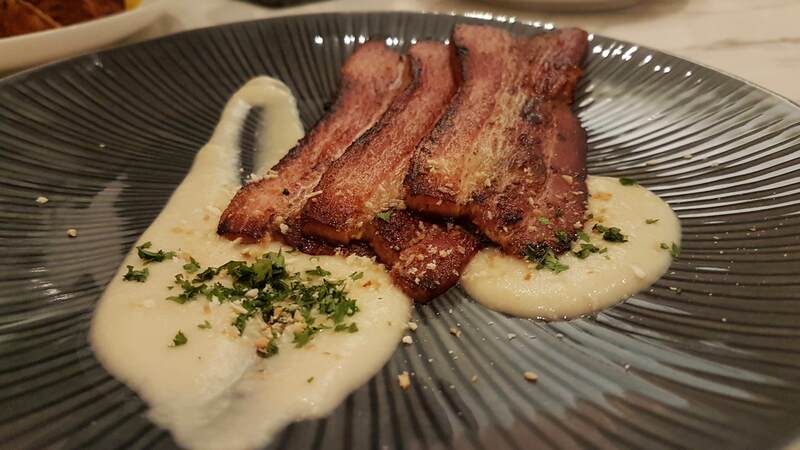 Instead of seeded mustard, the thick slabs of House-smoked bacon (RM21) ﻿are now served with a fluffy apple onion cream with herbed rub and parsley oil. 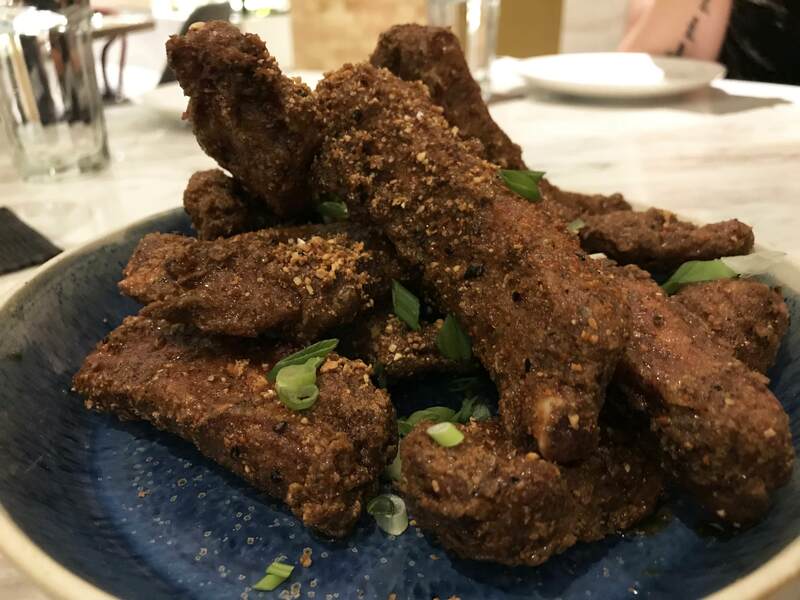 Probably our favourite dish of the night, the fall-off-the-bone Iberico Baby Ribs (RM68) are a perfectly seasoned with its heavenly blend of spiced flour, honey white soy glaze, crispy garlic, and the extra kick from the togarashi powder. 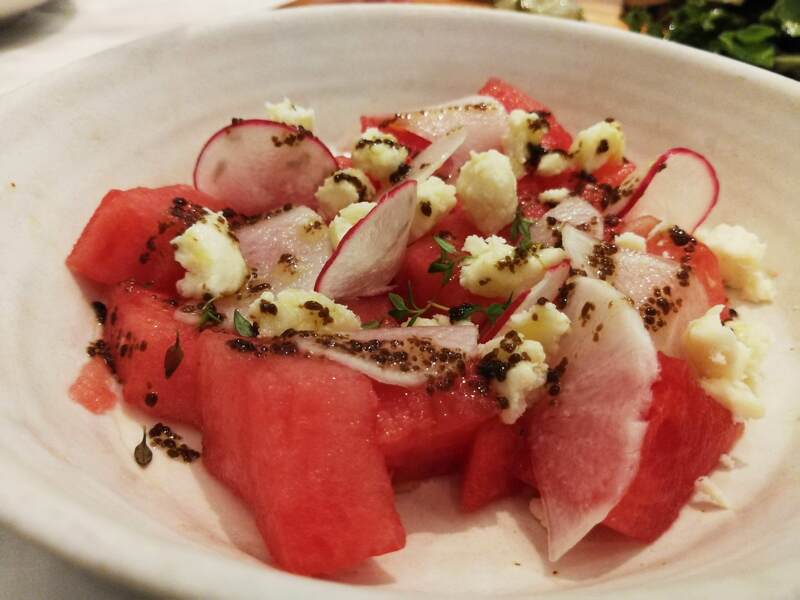 There is little green to be found in the super refreshing Watermelon and Pickled Radish Salad (RM15) with homemade ricotta cheese, garnished with thyme leaves, and dressed with extra virgin olive oil and parsley oil. 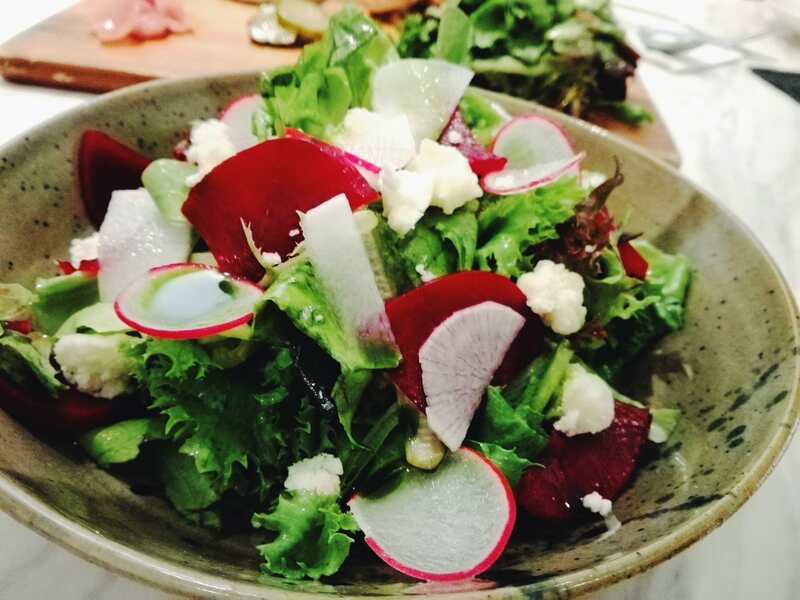 The homemade ricotta cheese returns in the Ricotta Cheese Salad (RM22), mixed in with mesclun salad with raspberry dressing, pickled red shallots and beetroot, and red radish slices. 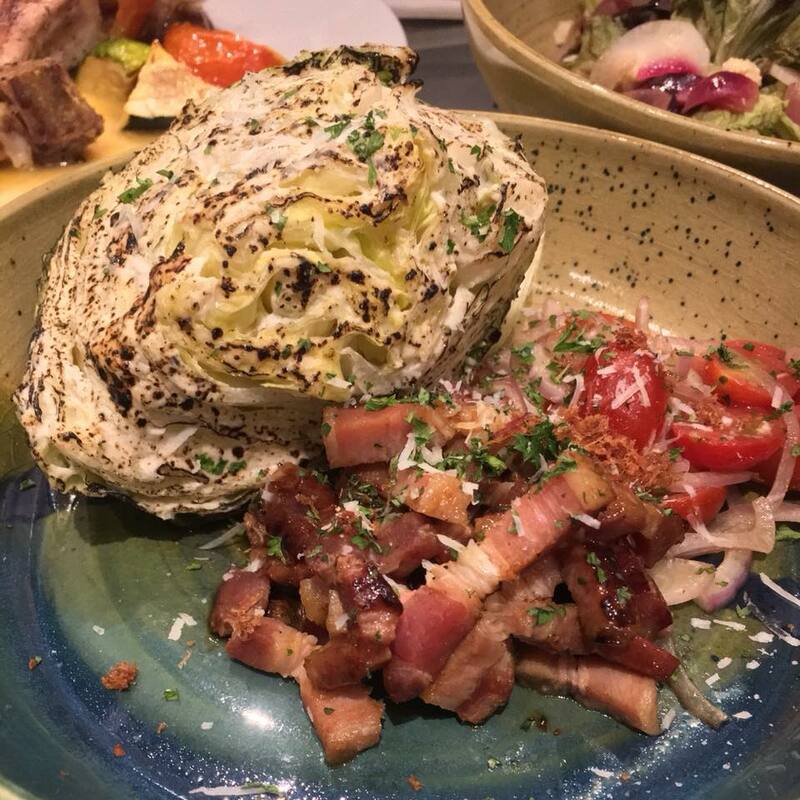 The Bacon Lettuce Tomato Salad (RM18) was a bit of a doozy, as we didn't quite know how to begin digging into the huge chunk of lettuce at first! The caramelised quartered iceberg lettuce with garlic dressing is served with sliced candied Gula Melaka house-smoked bacon, cherry tomato quarters garnished with chopped parsley and freshly-grated parmesan cheese. Homaigad, the Ham and Cheese Croquette (RM10) were fantastic! 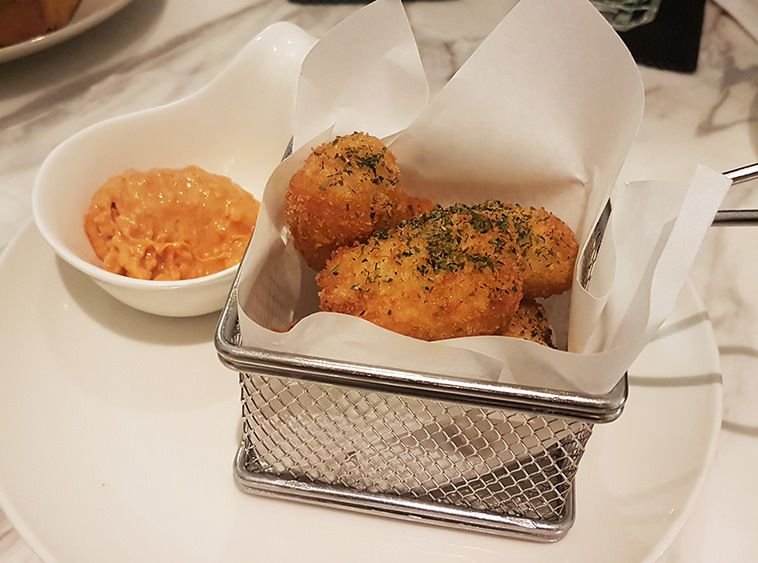 One bite into the deep-fried ham and cheese bites exposes a melty mushroom puree within, and the spiced garlic aioli definitely elevates the flavours. 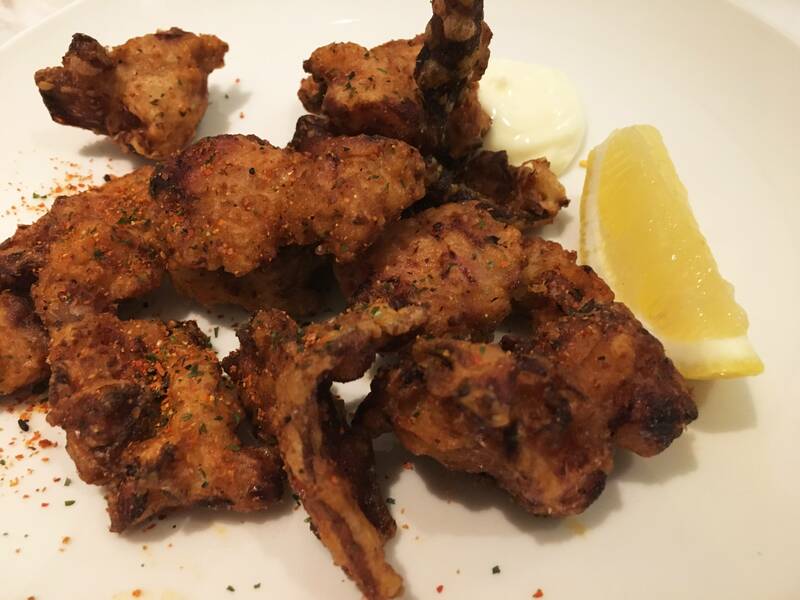 You'd probably find that you've cleared off half the plate of Chicken Karage in Togarashi Dust (RM14) while in conversation with your fellow diners; it's pretty addictive! 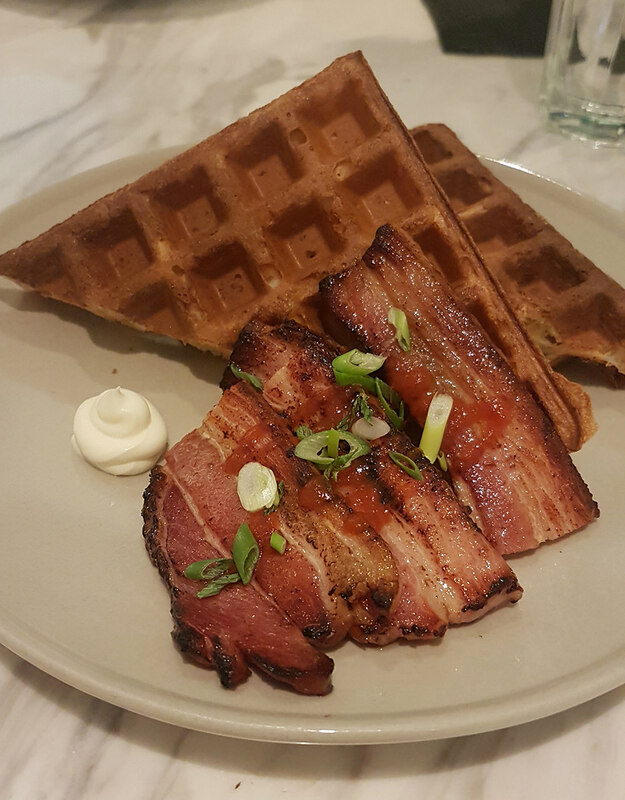 The Savoury Bacon and Waffles (RM18) may be a little too heavy to be considered a snack, and the slightly-sour crispy yeasted waffle batter takes a little getting used to. The dish is paired with smoked bacon slices with spicy sriracha sauce and garnished with a drizzle of honey. 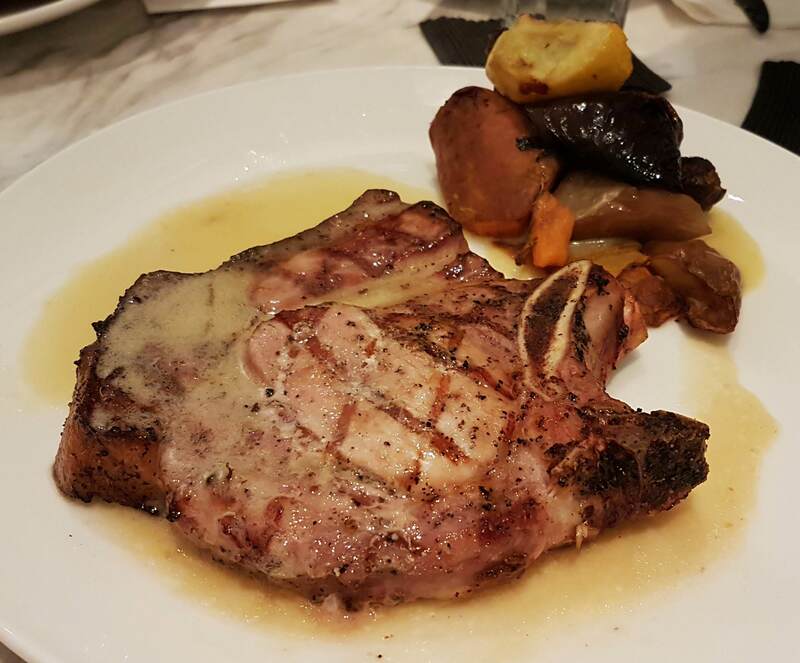 The Pork Ribeye Steak (RM47) remains a favourite (though our portion was a tad overcooked) - the cap of marbled dark meat, tenderloin, and buttery charred fat on the bone ensures you get the best of everything in a slab of pork, and the housemade truffle butter sauce is still one of the best sauces we've had. Now this is a surprise hit! 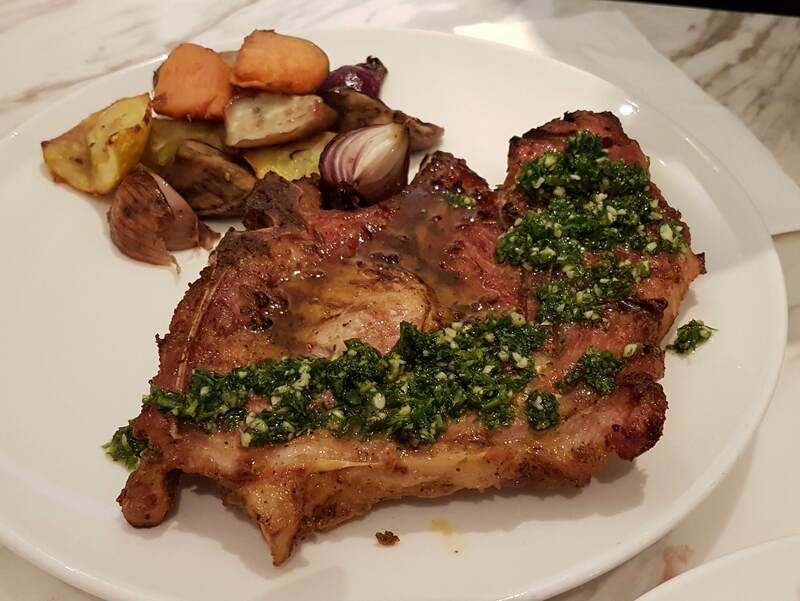 Unbelievably tender, the Chermoula Spiced Shoulder Steak (RM52) also boasts strong flavours thanks to its Moroccan and Tunisian spiced rub. The dish is served with a side of seasonal vegetables and salsa verde sauce. 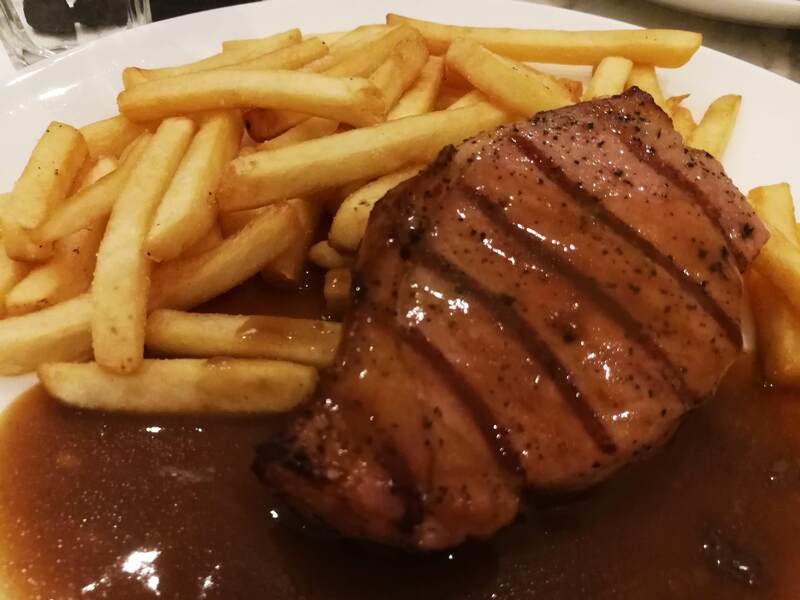 An all-time favourite of Miss Piggy from The Muppets (she calls it 'Steak Frites', the Steak and Fries (RM43) is a no-frills meal that's pretty self-explanatory - a chargrilled striploin served with a side of fries and black pepper gravy. 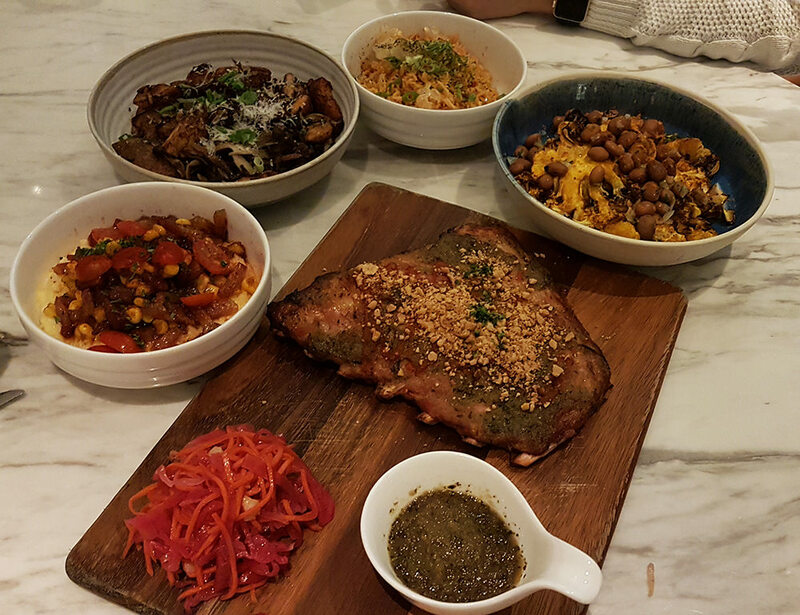 To accompany the mains and another helping of pork ribs, we got several newly-introduced sides to share. The Creamy Polenta, a dish that's similar to mashed potatoes, was especially yummy! (i) Creamy Polenta (RM13) - Creamy polenta topped with candied bacon slices, corn salsa, cheery tomato, and spring onion slices. (ii) Crushed Potato and Mushrooms (RM14) - Crispy roasted crushed russet potatoes, roasted shimiji, and oyster mushrooms garnished with spring onions and parmesan cheese. (iii) Pork Crackling Basmati Rice (RM12) - Hot fluffy cooked basmati rice with pork oil. Mixed with sofrito, crispy pork fat garnished with sliced spring onions, seaweed powder, and crispy chicharon (pork skin crackling). (iv) Cauliflower and Cannellini Beans (RM12) - Turmeric roasted cauliflower, canelini beans, salsa verde garnished with a sprinkle of curry powder. (v) Sweet and Spicy Pork Ribs - Baked sweet and spicy glazed pork ribs, pickled red cabbage and carrot salad garnished with sriracha sauce and crushed peanuts. 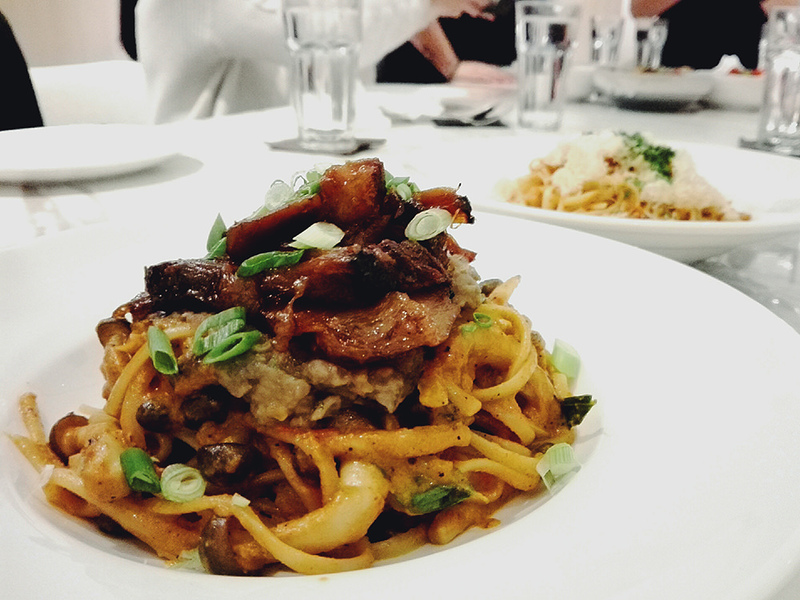 A familiar dish to many, ANTE's Bolognese (RM24) is of the pork variety cooked with red wine, served with linguine and garnished with freshly-grated parmesan cheese, chopped parsley and crispy pork crackling. Though we were already pretty full by the time the pastas came around, we couldn't resist digging into the Char Siu Curry Cream (RM35)! Served with a rich housemade curry paste and eggplant ragu, the dish is garnished with shimiji mushrooms, diced onions and garlic, curry leaves, and coconut cream, then topped with generous amounts of sliced homemade char siu. 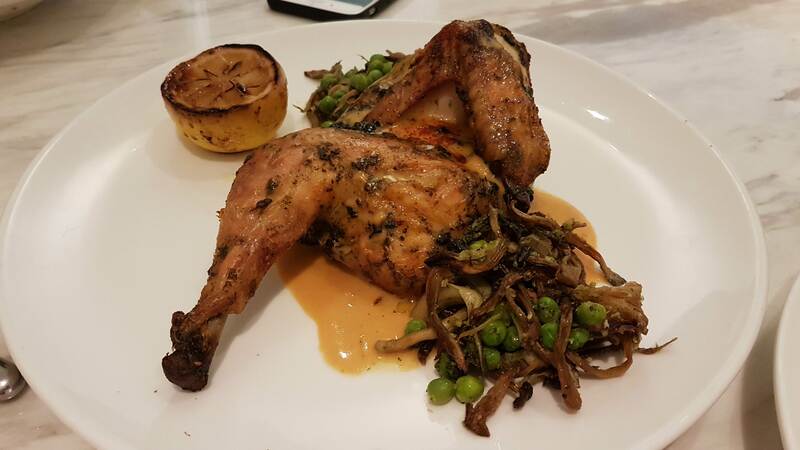 The Roasted Half-Spring Chicken is a safe choice for those who are not too keen on pork, served with roasted shimiji and oyster mushrooms, green peas, caramelised half lemon, chicken gravy, and herbed breadcrumbs. 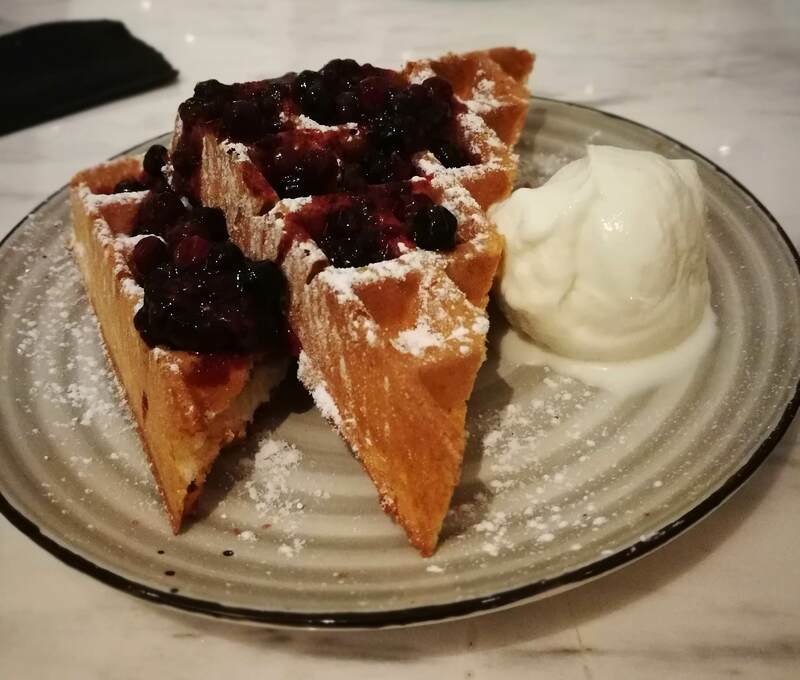 The Homemade Waffles make a comeback for dessert, but this time down a sweeter route, with macerated mixed berries on top and one scoop of Whimsical's Lavender Honey Gelato on the side. 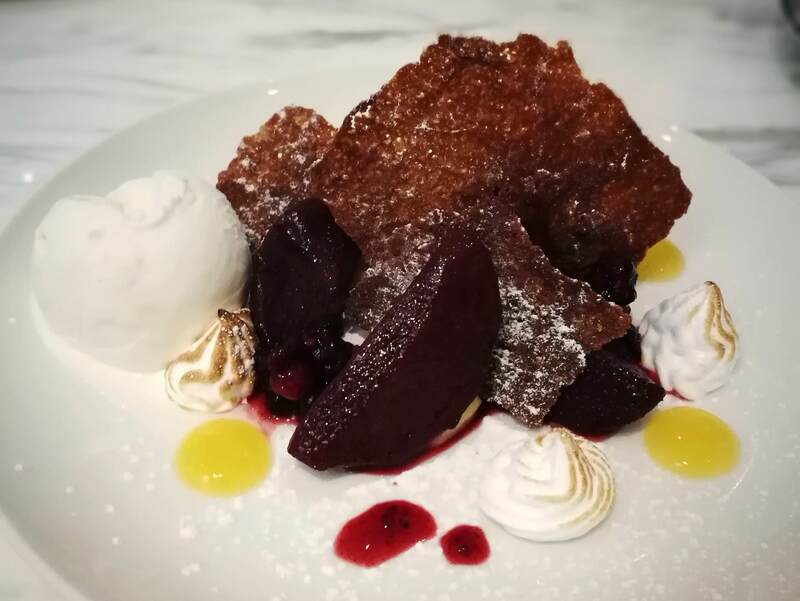 Cooked in red wine, the Poached Pears are served with white peach pastry cream, sable breton, macerated berries, Italian meringue, citrus gel, and one scoop of Whimsical’s Lavender Honey Gelato. Pretty AND fancy! 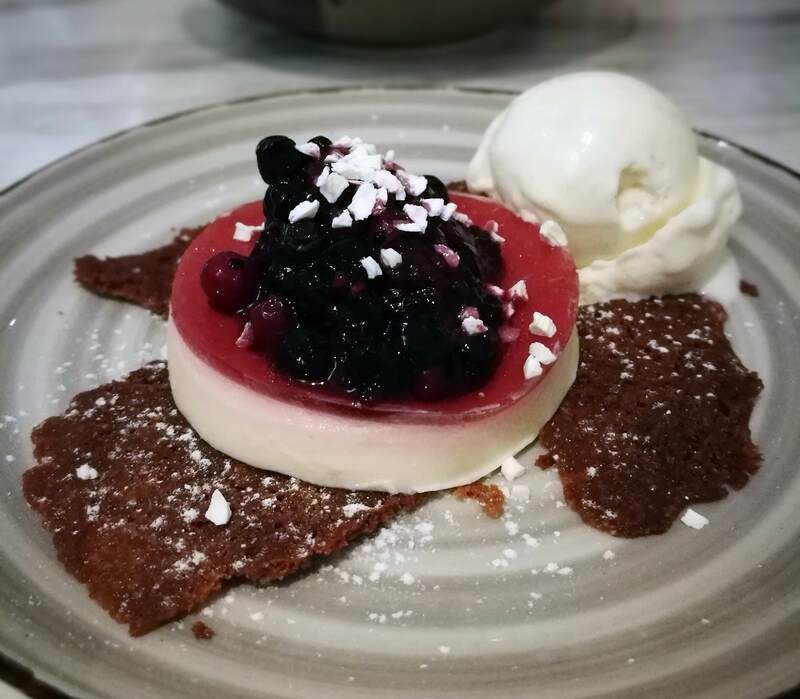 Those with a sweet tooth will love the White Chocolate Ganache, served with raspberry jelly coating topped with macerated berries, crispy yogurt, and one scoop of Whimsical’s Lavender Honey Gelato. We especially love the Baked Cheesecake! Not only was it a pretty big piece, the Italian meringue on top was a pretty nice touch to accompany fluffy cake. 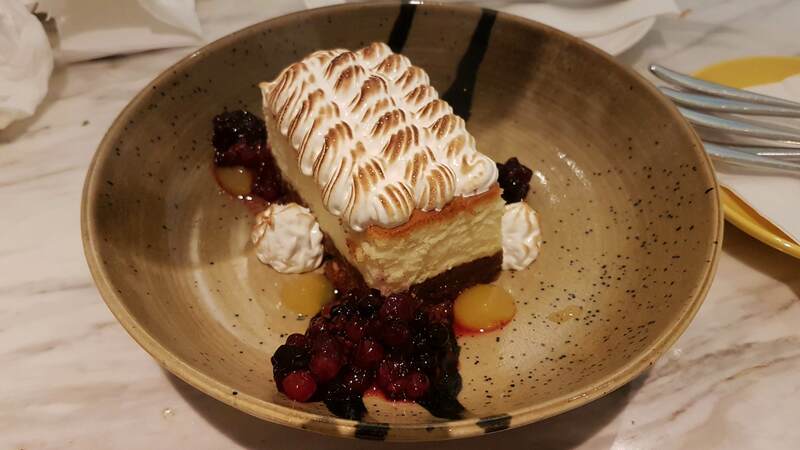 Homemade with a hazelnut wafer base, the Baked Cheesecake is served with citrus gel, macerated berries and soft Italian meringue.